Our first tour was the ‘Panglao tour’ but we had several stops along the way. 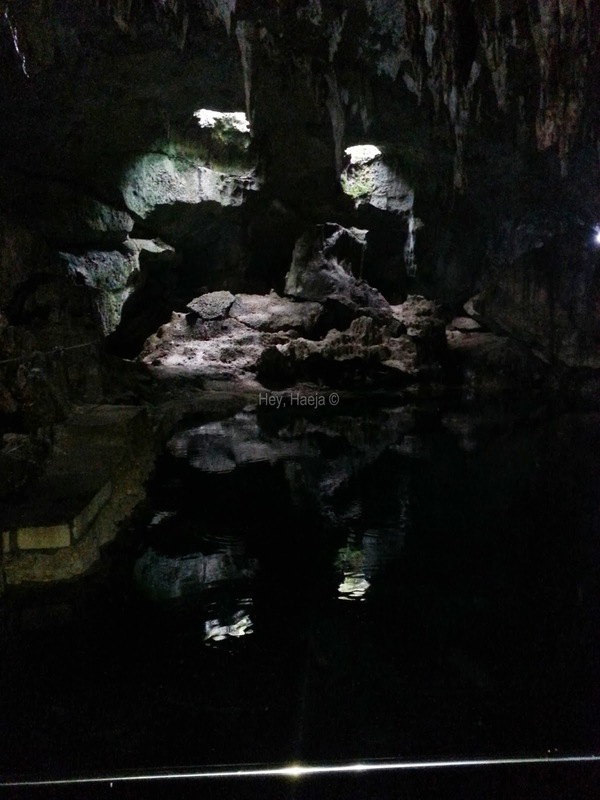 First up was the Hinagdanan Cave, which is an underground cave with a small lake. It will be better to have a guide with you because he knows where you should step to be safe. Our guide was Gibby, and if he’s around the area on the day of your tour, I highly recommend him. He takes fantastic pictures! Your guide’s fee depends on what you feel like paying, but there is a very minimal entrance fee as well. I hope you wear sturdy slippers during your tour so you won’t slip. Sadly, my Sandugo sandals did not have a great grip on the surface, and I had to be very careful where I trod. (It was sorely beaten by my Havaianas mud experience where I trekked through wet mud up a mountain and my slippers didn’t even break, and I didn’t slide.) 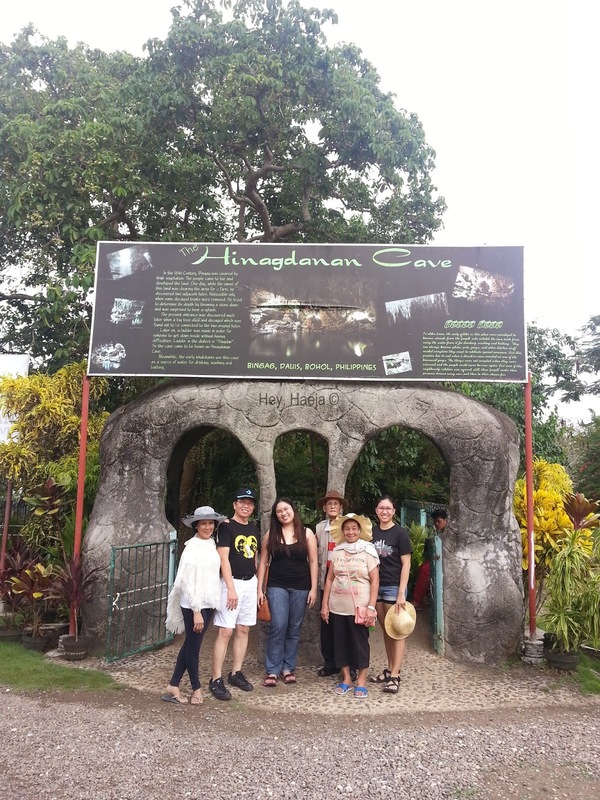 My mother, who was wearing Havaianas, had better grip on the slightly wet and uneven terrain inside the cave. It was not very dark underground, and there was sufficient light to go around. My grandmother initially balked at entering because she doesn’t like caves, but we managed to persuade her, and she even enjoyed herself. The cave doesn’t have that musky smell either. The lake reminded me of the lake in Harry Potter and the Half-Blood Prince where (spoiler) Harry and Dumbledore had to cross a lake filled with inferi. I wondered several times if a hand would suddenly shoot up and grip my ankles. No, that did not happen. Afterwards, we went to the Bohol Bee Farm for lunch. I’m not sure if you can check-in there, but they have a pool (open from 8am to 11pm, with a depth of three feet to seven feet). No one was swimming, however, while we were there. The server kept telling us that the food was good for one person only. That was so not true. Each plate we ordered was fit for two people, or three if you don’t eat much. However, the food was very delicious so we didn’t feel like complaining about it. We just took the remainder of the food with us back to Dao and ate it for dinner. After our very hearty lunch and shopping from Bohol Bee Farm’s native and honey produce store, we went to Panglao at 3pm (our tour started at 11am). 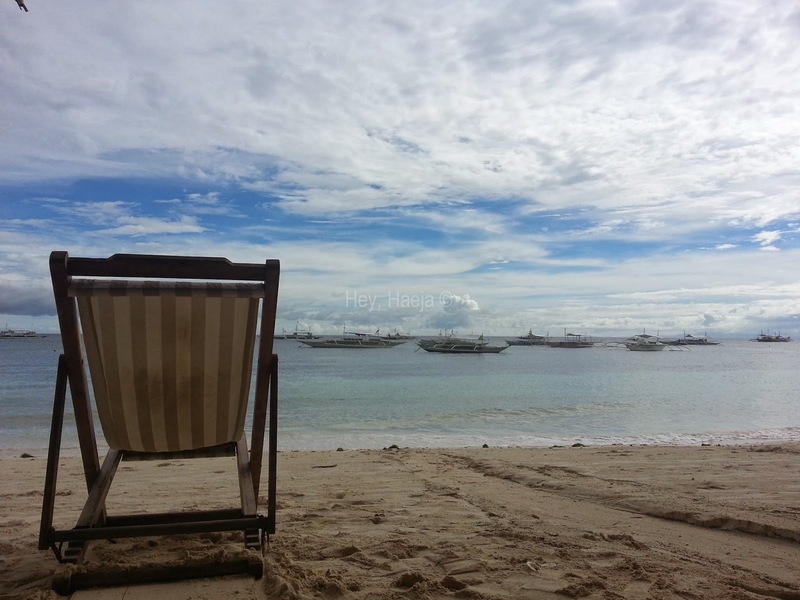 If you want to spend more time in there than in the countryside, and you want to visit more over several days, I suggest you book a room around Panglao. We found out to our dismay that a van will cost P500 from our hotel to Panglao for one way. And another P500 to get back. Yes, we could commute but since we were with several senior citizens, my mom wanted the ride to be comfortable. Also, this is so you can take a shower after bathing. We managed to get cleaned up by ordering drinks from one of the beach-side hotels, but we weren’t able to take a shower since we just used their comfort room to change clothes. I managed to persuade them to lend me a little tub to wash off the sand, though. It was, needless to say, a bit of an uncomfortable ride back to Dao Diamond. 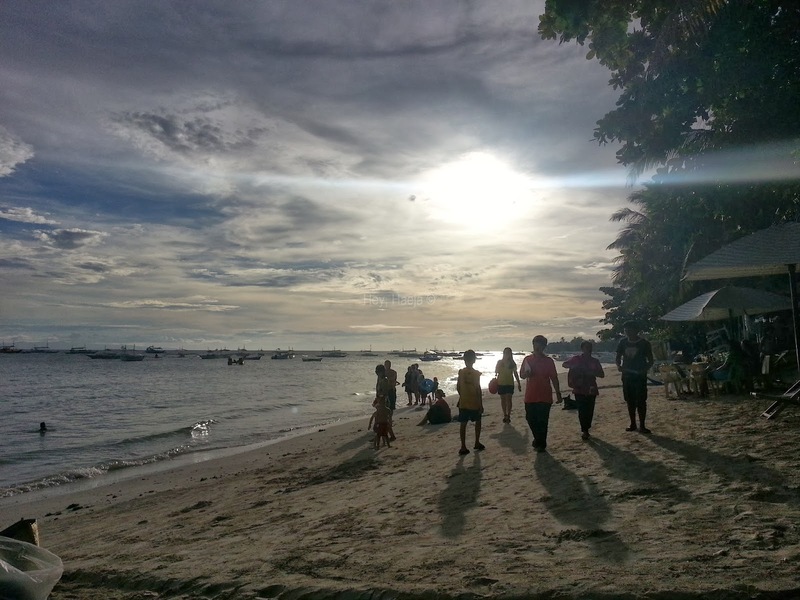 I know Panglao is very popular and quite picturesque, but I did not enjoy swimming there as I thought I would. There were too many sea urchins! I just stayed close to the shore, but even that was uncomfortable because I kept scraping my knees on the sand, shells, and broken corals. My dad, the enviable human fish, of course swam quite far away, and had fun feeding the sea urchins to a live starfish he found. Fast fact: Sea urchins are starfish food! The random things I learn from my dad. My sister and I are fans of henna tattoos, so when a tattoo artist approached us by the beach, we agreed to do it. It was pricey at P200, but he was the lone artist we saw in the area so we reluctantly agreed. He said the henna will wear off after one to two weeks, and I was actually disappointed because I wanted mine to last for far longer, but still we gave the go ahead. Oh my god, so disappointing! It was one of the not-so-good henna experiences I’ve ever had. 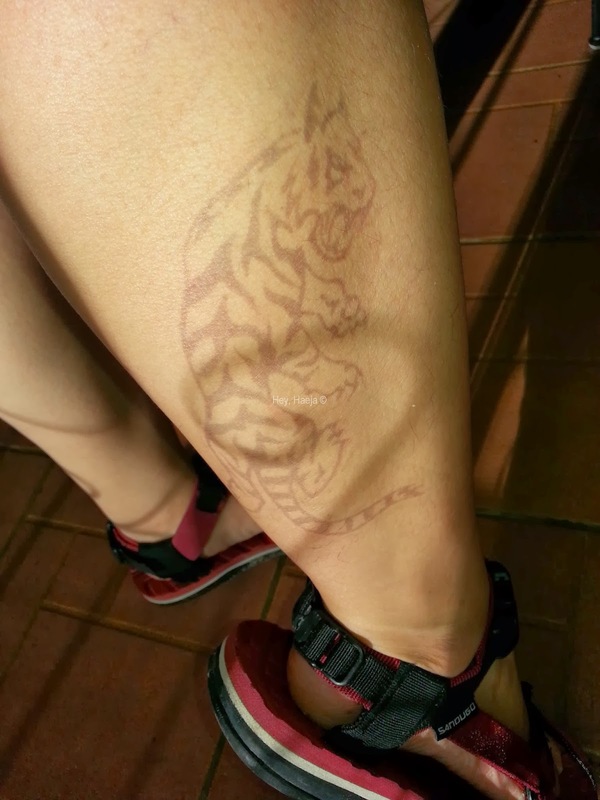 First of all, I pointed to a beautiful tiger tattoo, but the end product looked like a cross between a tiger and a monster. Second, the tattoo almost completely washed off after ONE wash. One. Ugh. What a waste of P200. It’s a blessing we were in a hurry because I wanted to get another one on my other leg. Sigh. Lesson learned in trusting henna tattoo artists. On our way back to Dao Diamond, we passed by the Dauis Church. In case you didn’t know, Bohol was hit by a terrible earthquake in 2013 which devastated a lot of the beautiful old churches. 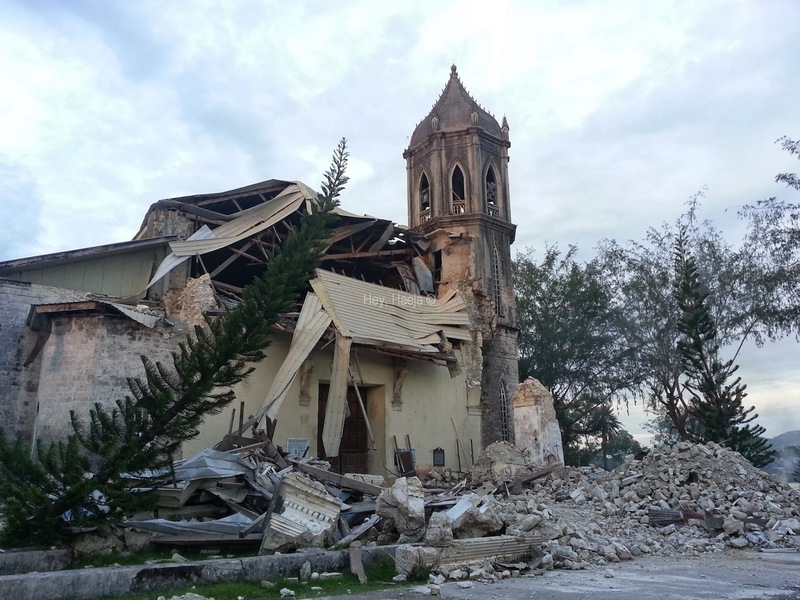 One of the churches ravaged by the earthquake in 2013. The sort of ‘miracle’ here is that the Mama Mary, which was right behind the Church, was completely unharmed. I was not surprised anymore; I’ve heard of a lot of stories where religious statues have been unharmed by natural disasters, but it still warmed my heart. Seeing this church, though, broke my heart. It was a historic treasure, and it was gone just like that. Sigh. I hope it can be restored to its former glory, although maybe more earthquake-proof. All in all, it was a good first day for us. If you want to tour Panglao, I suggest getting a van for hire if you don’t want to commute, or stay in an inn or hotel in Panglao for your stay. We opted to hire a different guide/driver on our second day for our countryside tour, which only cost us P1500 (not counting entrance fees and lunch), and he also regaled us with information about Bohol. However, his van was stinky and smelled strongly of urine, which gave me a headache all day (and I suspect it did not help matters with my sister’s chronic migraine). Okay, before I end here, here’s the tidbit I learned from our driver the first day. Do you remember your Philippine history taught during our elementary years? So the guide said Francisco Dagohoy was actually named Francisco Sandejas. ‘Dagohoy’ was from the term ‘dagon sa huyohoy’. Francisco Dagohoy was thought by the Spaniards to have some sort of anting-anting (amulet) because he was able to travel quickly from one spot to another and he eluded their capture for a long time. No, he didn’t have magic; he simply had memorized the 1400 underground caves of Bohol and used them to travel from one spot to another. Now that’s something you don’t learn from the classroom.